Everyone needs to receive care at some point in their lives, and nearly all workers will experience a caregiving challenge during their working years. Every year millions of working families welcome newborns or newly adopted children, care for sick family members or aging parents, or need time to address their own personal illnesses or injuries. But in spite of the universal need for time to provide care, the United States has yet to implement national policy solutions for workers who need to integrate family responsibilities with their responsibilities as employees. Successful paid leave programs have been implemented throughout the rest of the world and within individual states, but the United States has not yet adopted a national solution that would guarantee workers the right to any amount of paid leave for any reason. Over the past 11 years—since the first state paid family leave program was put into place—two additional states and more and more companies have created paid family and medical leave policies for their workers. Often, their programs are announced and implemented with great fanfare and positive media attention. While companies that voluntarily administer paid leave policies should be recognized for taking a positive step forward for workers, this is simply not enough. Companies are doing well, and corporate profits as a share of gross domestic product have rebounded to nearly as high as they were before the Great Recession. But while productivity is up, business investment in workers is declining. The majority of workers still do not have access to paid family and medical leave, and having the ability to care for yourself or your family should not depend where you live or where you are employed. A national policy providing paid family and medical leave is necessary because there is no evidence to suggest that the landscape will change dramatically or quickly without policy interventions. The United States is an extreme outlier among all other advanced economies—and among developing nations as well—because U.S. workers have no right to access paid leave for any reason at all. Virtually every other country in the world guarantees workers the right to paid maternity leave, and a growing number guarantee the right to paid paternity leave for fathers as well. Out of the 185 countries for which data are readily available, only two do not provide paid maternity leave: the United States and Papua New Guinea. To help put this into context, the gross domestic product, or GDP, in Papua New Guinea was $15.4 billion in 2014. U.S. GDP was $16.7 trillion in 2013. In short, the U.S. GDP is more than 1,000 times larger than the only other country in the world without a maternity leave policy, undercutting arguments that it is too expensive to take federal action. In addition to time off for parents to care for new babies, many other wealthy countries have provisions to ensure that workers also have access to paid time off in order to provide other types of family care or to address their own serious health concerns. The United States has no national policies to address these issues either. The only piece of federal legislation that currently exists to help workers when the need to provide family care or address a serious health concern conflicts with work is the Family and Medical Leave Act, or FMLA. The FMLA was signed into law in 1993 and remains a groundbreaking and vitally important piece of legislation. Under the FMLA, qualifying workers can take job-protected time off to care for a new child or seriously ill family member, to address their own serious health condition, or to address contingencies that arise out of military deployment. However, in order to qualify, workers must have been at their job for at least one year and must have worked at least 1,250 hours in the previous 12 months. Additionally, they must work for an employer with a minimum of 50 employees within a 75-mile radius. As a result of these relatively stringent eligibility requirements, roughly 40 percent of all workers are not covered for job protection under the FMLA. Additionally, even if an individual does qualify for job-protected leave, there is no guarantee that the leave will be paid. Only 48 percent of workers who take FMLA-type leaves receive full pay while they are out, while another 17 percent receive partial pay. As a point of comparison, nearly half—46 percent—of workers who reported needing to take leave but did not said it was because they could not afford to go without pay. And more than 60 percent of leave takers who did not receive full pay during leave reported that they had difficulty making ends meet as a result, while 84 percent of those who took unpaid or partially paid leave reported limiting spending. The dearth of public policies for paid family and medical leave belies the realities facing working families today. Only a generation ago, many families had an adult who stayed home full time to provide family care; this role was usually filled by mothers. But times have changed, and today the majority of women—and the majority of parents—are in the labor force. Most mothers work outside the home, including the majority of mothers with children who are under school age. And in most cases, women’s earnings are vital to their families’ economic security. Roughly two-thirds of mothers are either breadwinners—40.9 percent—or co-breadwinners—22.4 percent—for their families. Moreover, if married women had not increased their earnings from 1963 to 2013, income inequality would have grown more than 50 percent faster. While nearly half of children—44.7 percent—had a stay-at-home parent in 1975, only one in five—20.7 percent—did by 2008. In most families with children, all of the adults work, either because they are headed by a dual-earning married couple or by a single working parent. 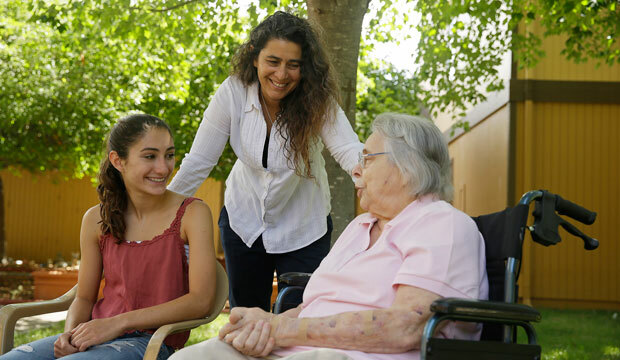 In addition, babies and children are not the only family members who may need care; working adults are increasingly caring for their aging parents. As of 2014, 16 percent of Americans, or 40.4 million people, provided unpaid elder care, and of those caregivers, 61 percent were employed. When women leave the workforce early to provide elder care, they lose an estimated $142,693 in lifetime wages, while men lose $89,107. While the United States lags behind the rest of the world on the issue of paid leave, there is no compelling reason why the United States could not create a national paid family and medical leave, or PFML, program. In fact, the United States has lower labor force participation rates and less economic activity because it does not have a national system in place. Women are the most affected by the lack of a PFML program due to the biological realities of childbirth and because mothers and adult daughters are the family members who are most likely to provide care to children or aging parents. And while women’s labor force participation remains high, the United States’ international ranking is falling relative to other advanced economies—and a significant portion of that decline can be linked to a lack of work-family policies such as paid leave. U.S. Department of Labor Chief Economist Heidi Shierholz has estimated that there would be more than 5 million more women in the labor force and more than $500 billion in additional economic activity per year if women in the United States participated in the labor force on the same level as their counterparts in Canada or Germany. Additionally, women who live in one of the five states with paid family leave that can be taken to care for a new child and/or temporary disability leave that can be taken for pregnancy are significantly less likely to utilize public assistance programs, such as Temporary Assistance for Needy Families, or TANF, or the Supplemental Nutrition Assistance Program, or SNAP, formerly known as food stamps. While women continue to provide the majority of family care, men have much to gain from a national PFML program. Men today report experiencing more work-life balance issues than they did in the past, and some surveys show that men report these problems more frequently than women. While fathers still provide less child care than mothers, today’s dads spend three times more hours per week caring for children than their counterparts did a generation ago. Millennial men in particular report that family time is significant to them, with 93 percent of those polled saying that paid family leave is an important issue. Access to paid, gender-neutral parental leave is not just a nice thing to do. As with maternity leave, it is associated with a host of positive results for families and the economy. Men are more likely to take parental leave when it is paid, in no small part because many dual-earner families cannot afford to have both parents taking unpaid leave. As a result, in the current policy landscape, more than half of the men who take parental leave take two weeks or less. Men are also more likely to take paternity leave when it is nontransferable to the mother, which is why an increasing number of countries are creating parental leave that is specifically earmarked for fathers. When fathers have access to paid parental leave and are able to actually utilize it, they report feeling more confident in their ability to care for their new baby and are more involved in caring for their children; these effects persist even after the leave ends and as their children age. Ensuring that men also have access to parental leave is important in facilitating fathers’ involvement with their children and promoting greater gender equity within homes, but it also has positive effects in the workplace. If parental leave is gender neutral—and men take leave as frequently as women—it helps reduce some of the stigma around taking leave. Currently, about 10.5 percent of the gender wage gap is due to the fact that women have, on average, shorter job tenures and longer gaps in their work histories than men, much of which is due to childbearing and family caregiving responsibilities. Gender-neutral parental leave would help decrease the differences between men and women, potentially shrinking the gender wage gap. The United States stands to gain quite a bit from creating a national paid family and medical leave program, and it is not an impossible goal. There are a number of examples and best practices from other countries that the United States can draw upon to develop and implement paid leave. The three states that have implemented their own PFML programs provide domestic examples as well. This report outlines how each general structure works and how it could function in the United States. Sarah Jane Glynn is the Director of Women’s Economic Policy at the Center for American Progress. *Correction, November 3, 2016: This report originally incorrectly stated the wage replacement rate for Rhode Island. The correct number is 60 percent.